Who is it for? Roop Mantra Mix Fruit Face Wash is an affordable gel-based facial cleanser suitable for oily to combination skin. Take small amount to the palm and mix it with water. Apply to the wet face and massage gently over face and neck. Wash off with water. The face wash comes in a white plastic squeeze tube with flip-top cap. The packaging is sturdy and spill-proof. The ingredient list is mentioned in the pack but the base materials have not been revealed. It has a light pink color. A food grade colorant erythrosine has been used to color this face wash. This colorant is used in liquid medicines like cough syrups. This face wash is transparent and has medium thick gel consistency. It is not a foaming cleanser. It has fruity fragrance in which apple scent is the most stronger to sense. The fragrance is quite strong but does not stay after it has been washed off. This is my first Roop Mantra product. I was quite excited to try this for all its ‘ayurvedic’ claims but after going through the ingredient list half of my excitement was gone. 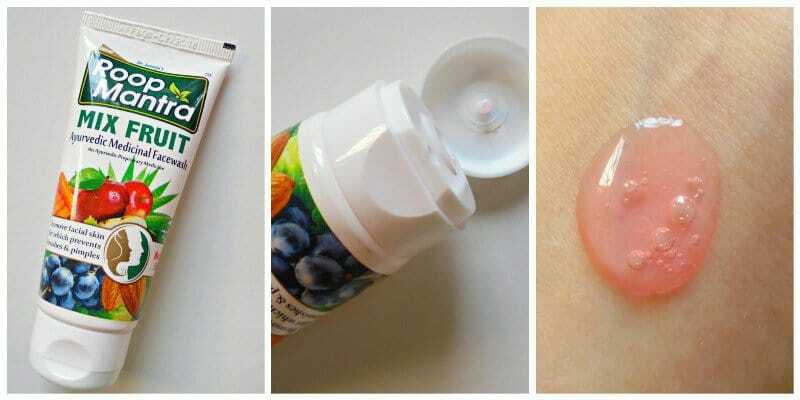 Firstly, the brand did not mention the details about the base for this wash, secondly the fruit extracts are just 2 or 3 % and lastly, the composition has added fragrance and parabens. Coming to the performance, it is a mild non-foaming cleanser. It does cleanse my oily-combination skin from excess sebum and dirt. I don’t feel stretchiness after using this and it did not induce pimples. What do I like about this face wash? What I dislike about this face wash? This is just another face wash with low herbal actives and lots of parabens. I might not buy it again as I don’t like products with unknown ingredients. If you are not bothered about parabens then only go for this. Kaya CC Cream – Who should BUY? There are so many food grade preservatives are available.. don’t know why these brands still use parabens..
Not so ayurvedic afterall then! Not a good buy for me. I don’t think it’s a good buy at all..
i have tried the cucumber variant… trust me i hate the product… thanks for the honest review.. again they just claim to be ayurvedic and all..